December 10, 2016 – Was Pluto’s frozen heart formed in an ancient impact basin and was it once closer to the north pole? And does the icy heart conceal a subsurface ocean? Scientists are offering several new scenarios to explain the formation of Pluto’s frozen heart-shaped feature, first spotted by NASA’s New Horizons spacecraft in 2015. Researchers have focused on the heart’s western lobe, informally named Sputnik Planitia, a deep basin containing three kinds of ices—frozen nitrogen, methane and carbon monoxide—and appearing opposite Charon, Pluto’s large, tidally locked moon. While many scientists suspect that the western half of Pluto’s heart formed within a basin created long ago by the impact of a large Kuiper Belt object onto Pluto, at least one new scenario requires no impact. Research by University of Maryland astronomy professor Douglas Hamilton and New Horizons colleagues, published this week in the journal Nature, shows that this nitrogen ice cap could have formed early on, when Pluto was still spinning quickly, and did not necessarily require an impact basin. “Once the ice cap forms, it provides a slight asymmetry that either locks toward or away from Charon when Pluto’s spin slows to match the orbital motion of the moon,” Hamilton said. Using computer models, Hamilton and coauthors found that Sputnik Planitia’s initial location could be explained by Pluto’s complex climate, itself forced by the 120 degree tilt of Pluto’s spin axis. (For comparison, Earth’s tilt is 23.5 degrees.) Modeling Pluto’s temperatures showed that when averaged over Pluto’s 248-year orbit, the 3 0 degrees north and south emerged as the coldest places, far colder than either pole. Ice would have naturally formed around these latitudes, including at the center of Sputnik Planitia, which is located at 25 degrees north latitude. Hamilton’s model also showed that a small ice deposit naturally attracts more ices by reflecting solar light and heat. As a result, temperatures there remain low, which attracts more ice, and the cycle repeats. Called the runaway albedo effect, this phenomenon would eventually lead to a single dominating ice cap, like the one observed on Pluto’s heart. Under Hamilton’s scenario, the ice cap may have been heavy enough to sink a few miles or kilometers into Pluto’s crust, which could explain why Sputnik Planitia is lower than the surrounding terrain. 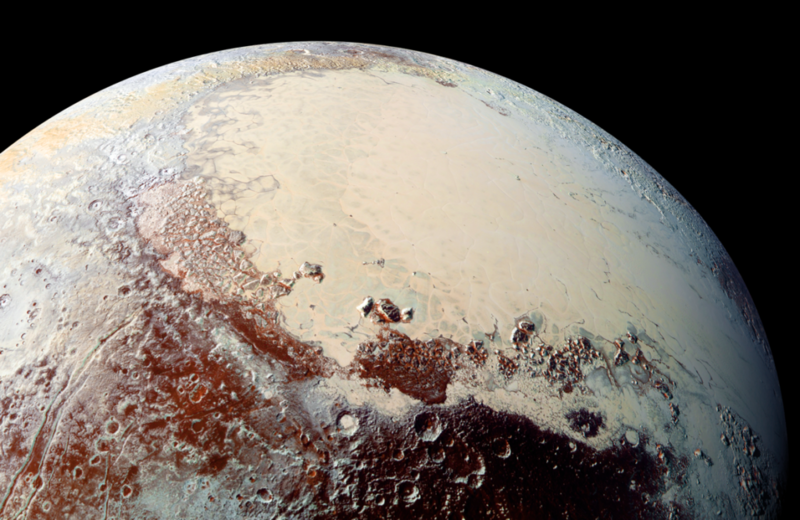 An ocean beneath the surface can survive for billions of years because of heat produced by radioactive decay in Pluto’s rocky interior, he said, adding that the slow refreezing of an ocean can also explain the network of fractures seen on Pluto’s surface.